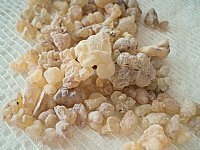 Frankincense Tears (Boswellia carterii) from Kenya. Tears are obtained via the tapping of the boswellia tree. Incisions are made in the bark, resulting in the exudate of a milky liquid, the oleo-gum resin. This resin hardens upon exposure to air into "tears" which are then detached from the tree. Boswellic acids are the active constituents present in the resin but not the essential oil. These tears can be burned as incense (we include one charcoal disc with your order) or ground into a powder. They can also be steeped into a carrier oil for use as a massage oil. The tears themselves do not have an aroma but upon burning them as incense you'll experience the smoky, grounding, intoxicating aroma so characteristic of frankincense. Please note these tears are for external use only. We do not offer these wholesale.